Kings Arms InnOak beams, an open fire and friendly faces greet visitors as they walk through the door of this 500-year-old Inn, which has nine tastefully furnished comfortable bedrooms. Join us for a relaxing stay amidst the green hills and dales of Lakeland, and we will be delighted to offer you good food, homely comfort and warm hospitality in historic surroundings. Good dogs and children are welcome. Kings Arms sometimes limits bookings to 3 or more days. Twin Room sometimes limits bookings to 3 or more days. From M6 jct 36 follow the A590 to Newby Bridge. Take the first right after the roundabout, over the bridge and follow the road for 8 miles to Hawkshead. 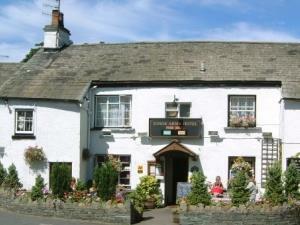 A lovely country inn with a good atmosphere and decent food. It would have been perfect if the bath room had been a lite bigger.